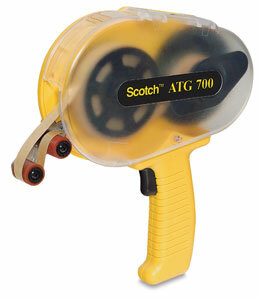 3M's Scotch Adhesive Transfer Tape is a wonderful alternative to double-sided tape! Pull the trigger on the lightweight ATG-700 dispenser and roll out a strip of permanently strong, clear adhesive, sticky on both sides. It's ideal for mounting, framing, and attaching flaps or covers. The dispenser applies the adhesive while winding the kraft liner inside. Scotch #924 Tape — Available in two widths, ½" and ¾" (approximately 13 mm and 20 mm).